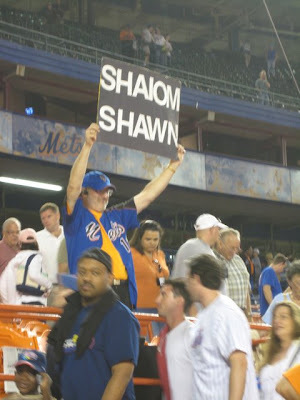 From a recent Shea Stadium game; for Jewish player Shawn Green. Green hit a home run to win the game! Judging from the size of the paper this fellow's carefully cut out letters are glued to, and the very tight kerning between the A and W in SHAWN, I'd say there was a slight miscalculation of how much space he had to work with. I wonder if this L abomination was enough to turn EstoEric to the Yankees? Oh I suppose he meant well. He could have bent the M off the page. Id' have to agree with the miscalculation theory..
oddLy enough, this site is giving me a good old giggLe..
What is the procedure in sending a photo in if by chance I happen upon one?